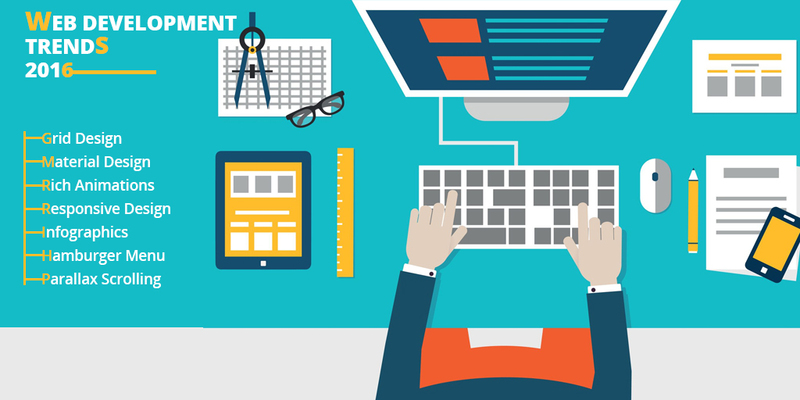 HomeWeb DevelopmentWhat are the Best Web Development Trends to Impact 2016? What are the Best Web Development Trends to Impact 2016? Web development trends are adapting over time as the advances in technology especially web design bring revolutionary web design trends with some having greatly inspiring impact. These are the next generation trends that stand to define the future of web design. The web design trends encourage several aspects like website display and functionality, better and improved client user experience among others. Grid Design with visual narrative information appears even and site visitors enjoy wide view of page giving easy navigation or data browsing. The designs draw website visitors as they impress with faster browsing. Material Design: Google launched innovative style language for website developers across the globe with convergence on making clean and modern images based on user interface with lightweight code. They use shadow effects to make images look pragmatic. The design follows trendy flat design, but variation of material design applies depth and shadow to make images realistic weighed against flat design images. Rich Animations build more website likable and engaging websites with impressive inputs. Responsive Design: All users like mobile devices especially when shopping as they are simple and give faster accessibility. Having mobile versions of websites aids target relevant audiences and get better profits.Responsive design websites may have shortfalls like performance but can be circumvented by these steps when designing for optimum results. -Execute performance testing in development process to ensure website is responsiveness and optimization. -Evaluate validity and promptness of third party scripts and impact on performance. Infographics: Inform audience then through text-based content. Images have alluring look and pass vital news easy to grasp. Infographics are interactive through links or animations enabling interaction with data. Hamburger Menu; are easy ways to refresh pages evading mess in navigation and creating space for important content. Parallax Scrolling changes nature of page scrolls while surfing and background images shift sluggishly in comparison with foreground images in 2D illusion. Deep impression on viewers and lends depth and interest to website as scrolling is an easy task. Ghost Buttons: transparent buttons appearing in simple lines placed on pages with inner link text printed in light. Appearance is rectangle or square shape stirring enough to give pleasant appearance to websites. High Definition Images: High definition images strategically used to draw attention of website visitors illustrate specific ways of what websites represent. With high definition clear and sharp images or graphics such resources may make websites loading speed slow, yet by using advanced data bandwidth and data density features facilitation of faster loading process and better ways to engage with online audiences is achieved. Micro-Interactions: Micro-interactions are basic and minute communications applied when connecting with user interfaces at particular moments. These micro-interactions add fun to website browsing when carried out flawlessly. They are relevant in website design as they start exchange with users to get opinion directly. These web development trends are bound to give users enriched online experience enhancing business presence extraordinary interactivity of websites.